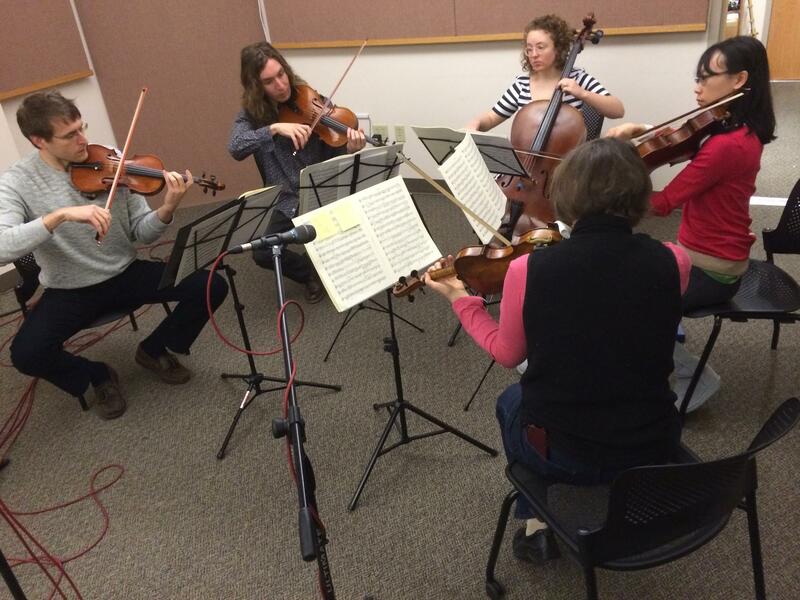 The Delgani String Quartet is a new ensemble, featuring Wyatt True and Jannie Wei on violin, Morgan O’Shaughnessy on viola, and Kelly Quesada on cello. Delgani will perform twice in upcoming days, including this Sunday, March 29th at the Secret Garden in Eugene in a benefit for the Fanconi Anemia Research Fund, and in their official debut on April 7th at United Lutheran Church in Eugene. At the Secret Garden, they’ll be joined by Sharon Schuman as a guest on violin. They debuted in radio style in the SELCO Performance Hall of the KLCC studios. Live performance and interview with the Delgani String Quartet in the KLCC studios. Delgani String Quartet. Left to right: Wyatt True, Morgan O'Shaughnessy, Kelly Quesada, Jannie Wei, and guest Sharon Schuman.